A locally coordinated research project is underway in the Torres Strait to see if a type of bacterial skin infection can best be managed by health workers and nurses in community rather than in a hospital setting. The Cellulitis Outpatient Intravenous Antibiotic Study (COAST) is being led by Thursday Island Hospital Dr Allison Hempenstall, who received an Emergency Medicine Foundation research grant and a HOT North grant to undertake the project. Cellulitis is an infection caused when bacteria enters the skin through an ulcer, cut or a scratch or an insect bite, however, it can also occur without any visible damage to the skin. Dr Hempenstall said cellulitis could affect almost any part of the body. “Most commonly, it occurs on the lower legs and in areas where the skin is damaged or inflamed,’’ she said. “Anyone, at any age, can develop cellulitis, but you are at increased risk if you smoke, have diabetes or poor circulation. “The main signs of cellulitis are skin that is red, painful, swollen, tender and warm to touch. “People with severe cellulitis can get fever, chills, sweating and nausea, and might feel generally unwell. “They can quickly become very unwell and a small number of people may develop serious complications. Dr Hempenstall said cellulitis was very common in a tropical environment such as the Torres Strait and Northern Peninsula Area. “Often, patients with the condition present to health care facilities in the Torres Strait with cellulitis and are then transported to Thursday Island Hospital for intravenous antibiotics,’’ she said. “This can be a major upheaval for the patient and puts pressure on the hospital system. “However, in other parts of Australia, nurses and health workers managing cellulitis with antibiotics within the community has been found to be safe and as effective as in-hospital treatment. “Our research study aims to find out if Torres Strait people with cellulitis can be treated in this way, instead of having to be transported and admitted to hospital. “We expect that the results of this study will show that treating cellulitis in the community is just as effective. “This will show that patients don’t need to be transferred to a hospital, away from their family and friends. Dr Hempenstall said the COAST research project was funded by a $35,000 grant from the Emergency Medicine Foundation JumpStart program and a further $35,000 from the Menzies School of Health Research Hot North program. She said the two grants also had helped fund the employment of an Indigenous research officer, Pelista Pilot, to help compile the data from participants in the study. “So far, we have already signed up 80 participants to the study and expect more to join,’’ she said. “I expect we will be collecting data for about six months, before sitting down to analyse it. The Emergency Medicine Foundation’s Queensland Research Program is funded by Queensland Health. 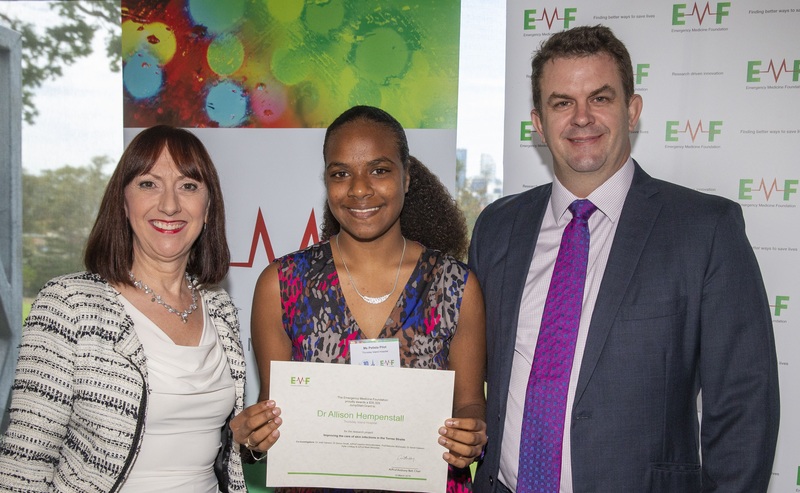 Pictured above: Indigenous research officer, Pelista Pilot, receiving the Emergency Medicine Foundation grant from the Foundation’s General Manager, Dr Sonĵ Hall, and Chair, Dr Anthony Bell.